You may be able to take the bus by waiting at a bus stop before the bus passes at the time indicated on the timetable. 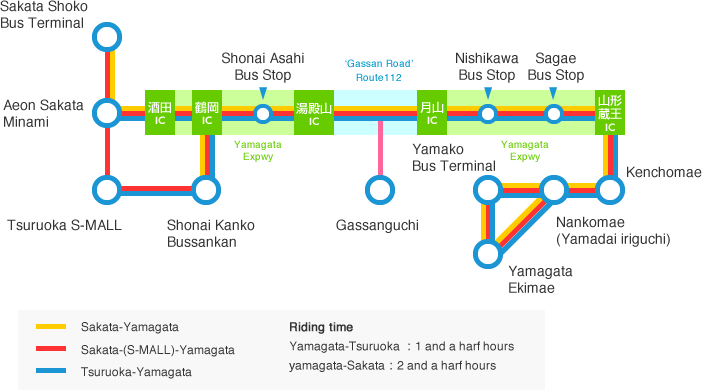 Note 1: The bus is connecting to the express bus at Shonai Kankou Bussankan. When using a connecting bus, please purchase the ticket before boarding. Passengers holding the ticket for an intercity express bus may be on board of the connecting bus for free of charge. In case of a bad weather, etc., the bus schedule may be changed without advanced notice. Please note this prior to using our services. The routes may be altered due to traffic restrictions, in such cases as festivals. In the above table, the box at which the bus stops you get on and off meet indicates the fare for the section. (e.g.) The fare for the section between Yamagata Station and S-MALL is 2,470 yen; the fare for the section between Yamagata Station and the Shoko Bus Terminal is 2,730 yen. Only non-reserved seats are available for buses on the Yamagata line. Please take a numbered ticket when boarding, and put the fare and the ticket into the fare box when getting off the bus. The change machine on the bus accepts only 1,000-yen bills. Larger denomination bills are not accepted.